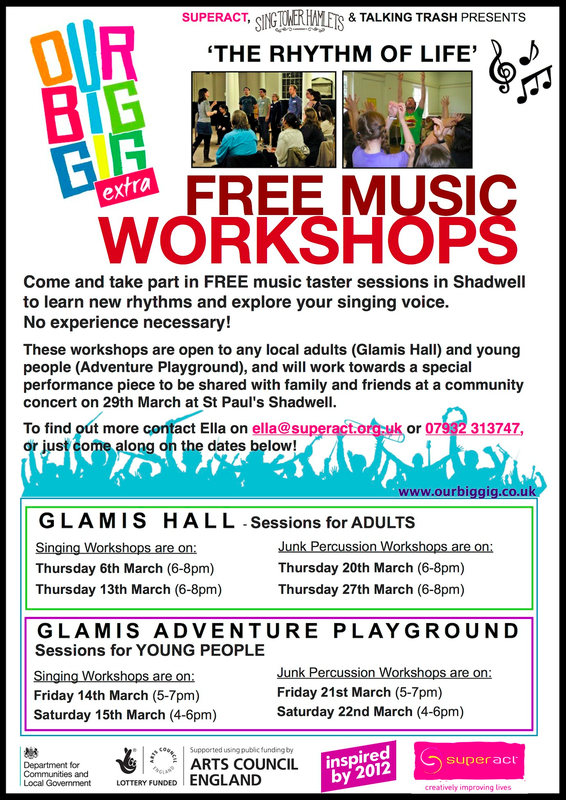 Free Music Workshops in March! Throughout March, Sing Tower Hamlets is working in partnership with Superact to help deliver an Our Big Gig Extra project in Tower Hamlets. ‘The Rhythm of Life’ is based in Shadwell, and offers free singing and junk percussion workshops for adults and young people in the local community. We are excited to be working with Glamis Hall and Glamis Adventure Playground on this project, and looking forward to the workshops starting this week. See the flyer below for dates, times and locations of the workshops! The workshops will culminate in a final performance, alongside Sing Tower Hamlets community choir, at St Paul’s Shadwell on Saturday 29th March. Keep an eye on the blog for more information on that performance! £2429 Raised for GrowTH this Christmas! 13th December 2018: The Choir Is So Delightful! Fifth Birthday Gig: Lots to Celebrate!